So you're ready to dig deeper? I've collected my favorite quotes and passages, taken from the very words of the folks in my book, and created a 25 unit curriculum, all ready to print and go. 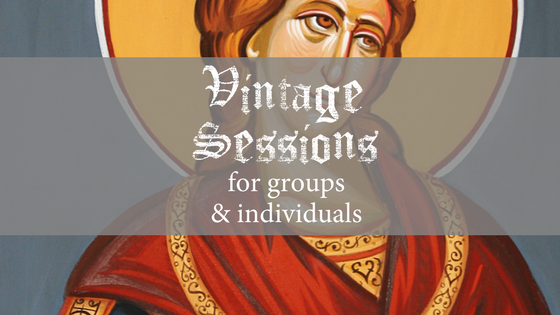 There's one Vintage Session for each chapter of Vintage Saints and Sinners: 25 Christians Who Transformed My Faith. So...scroll down the page and it’s all there. Gather a few friends, print out the free pdf handouts and dive in. I've created a leader's guide with questions for group conversation or individual reflection, as well. Let me know how it's going! I'm always happy to meet you and your friends via Skype or even in person.Drop me a note at karen@theologicalhorizons.org. Blessings on your adventures with Vintage saints and sinners! Session 7 | You Shall Not Die But Live! Session 15 | Stand Up, Sing Out!